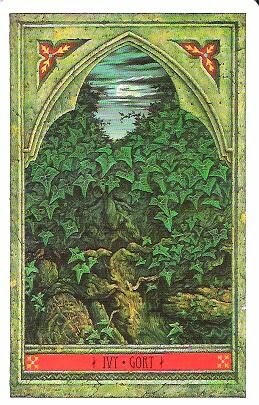 This week comes the penultimate card in our look at this fantastic Oracle deck: it’s the Ivy, with the Ogham name of Gort. The wise words of the Green Man about this plant is rather apt. Ivy uses, needs and provides support throughout its life and in truth, can be a pain when it gets out of control, as any gardener known. Once it gets going, it’s strong, hard to get rid of and forever green. In the winter, it’s often paired with the Holly, for the ever greenness of it. The Ivy reminds us that help can come in many forms, but first, we have to acknowledge that we need the support. Whether it’s asking for help from friends, work colleagues, spiritual resources or in doing the house-hold chores, someone to drive you somewhere, someone to fetch you some shopping or even make you something to eat. We believe we’re independent creatures, that we can and ought to, stand alone. But I don’t feel we are: we’re better when we’re stronger, work as a team and when we allow others to help us, to support us, we gain strength. Just like the ivy takes strength from the wall or tree upon which it may climb. Why be prideful and stubborn? We all get exhausted from time to time, for lots of different reasons and those negative attributes should not stand in the way of any assistance that is offered. The wise words of the Green Man are rather specific here: acceptance of support is what is most important. There is a lot of lore attached to Ivy: The form and shape of it, along with its spiralling growth pattern, link this plant to the movements of the stars and constellations and is sacred to the Moon, just as its winter counterpart, the Holly, is linked to the Sun. The Ogham with this card reminds me of the moon shining between the trees on an autumnal evening. Here it is on the right. I’ve learnt from the reference book that comes with this deck, that Ivy flowers in the autumn and sets its seed in spring. Along side this strange timing of when to produce and set seed, Ivy is linked to brewing houses and taverns, who used to use Ivy leaves to alleviate the effects of too much drink, whilst increasing the potency of the alcohol! 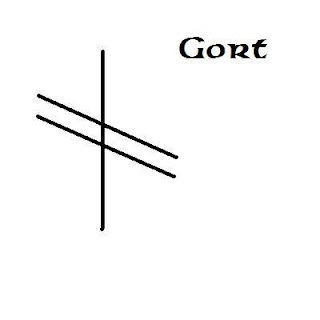 It was also often used as a sign above taverns to indicate that it only served the best brew! Ivy and white ivy leaves are sacred to various Goddesses of the Moon, including Ariadne and Artemis from Greek mythology, Pasiphae from the Crete paths and Arianrhod from the Celt. It is also rather a good bush to hide behind, as it can be rather a dense foliage plant. It is said that the Irish hero, Fionn was kept hidden from enemies by ivy that clad a tree, which is why some stories featuring Fionn often have ivy in them. For this week though, if you need the help, please do ask. There is no point in struggling on alone, tired, weak and in need of company and help. We’ll get there quicker, in a healthier state of body and mind, if we ask for help!